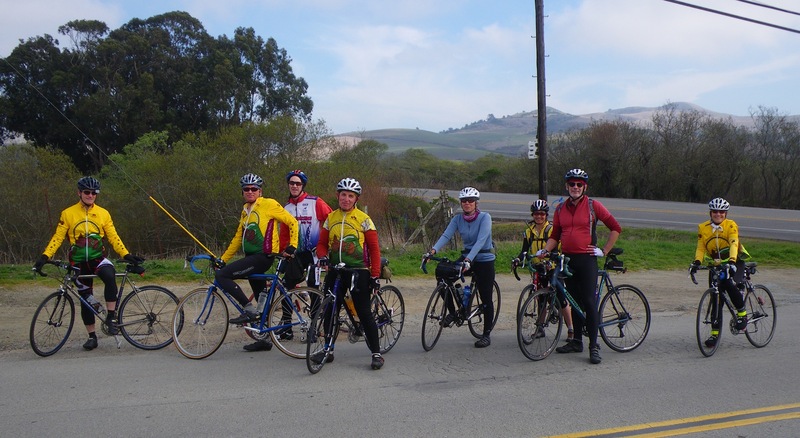 The warm weather continued another week, and Sherie and I had time over Feb 12 and 13 to ride with our club, the Grizzly Peak Cyclists. On Saturday Ben led one group on Alex’s Second Saturday Ride (ASSR) on a fifty miler to Danville Peets Coffee from Orinda BART. Now, on the ASSR, the rides are not rated the usual GPC pace (Leisurely, Touring, Moderate, Brisk or L, T, M, and B) but by musical time signatures (Presto, Allegretto, etc.) There is some important historical reason for this back in the archives of the club history. But just note that the route/group Ben “led” is rated T (for Touring pace) and has two hard hills, and several steady ones. But it does feature lots of flat miles too aproaching (and leaving) the turnaround point in Danville. It usually attracts pretty self-sufficient riders, most club experienced, that ride well faster than the advertised touring pace. The start of the ride is the Orinda BART station parking lot, and people gather at one place for five different groups on the ride. John, a likeable GPC volunteer, organizes the route and signup paperwork, so as a ride leader Ben just had to volunteer before anyone else (beat Sherie this month) and help a bit with herding the “cats” that sign in. There were fifteen people signed up on Ben’s group (Sherie included), but several of those told Ben they were going to ride with another group after the mass start, and others told Ben they signed up with other groups but would ride with us. UGH!, a ride leaders nightmare: not sure how many riders are in the group, and not knowing their names. What makes the ASSR special is that typically there are no other club rides that day, and that riders of all paces ride together for the first six miles in a social “double paceline.” On Saturday we had a cold morning, and the slow paceline was pretty sedate as we conversed our way out to the first “regroup stop.” This is where the various groups are to splinter, as leaders take their charges out onto the road (initially all on the same road) with a minute or two between them. Most groups take different forks over the next few miles, but eventually two groups share the ride to Danville Peets. Today the “slower” group supossedly was Ben’s Allegrettos, but we had faster riders and found ourselves on the road in front of the other group. At least Ben thought it was all his group, because the fluidity of who signed up for what, and rode what segment. However, Ben had fifteen riders at the second regroup (intersection of Olympic and Pleasant Hill). Ben likes to lead from the back (at least on the flats) so he can help stragglers or those with mechanical issues. So when Ben asked Sherie to lead out the group through the maze of turns over the next few miles, little did he know that with her new strength would she lead them at near M pace. And Ben and Mark, starting about a minute or two behind them, did not see them again until we pulled into Peets. They indeed had ridden the flats with a head start, and a mile or two faster than the very comfortable pace of Ben and Mark at the rear. And after lunch (there is also a cafe, market with deli, and bike shop next to Peets), the pace was again pretty quick back toward Orinda and the one steep hill remaining (Happy Valley Road). 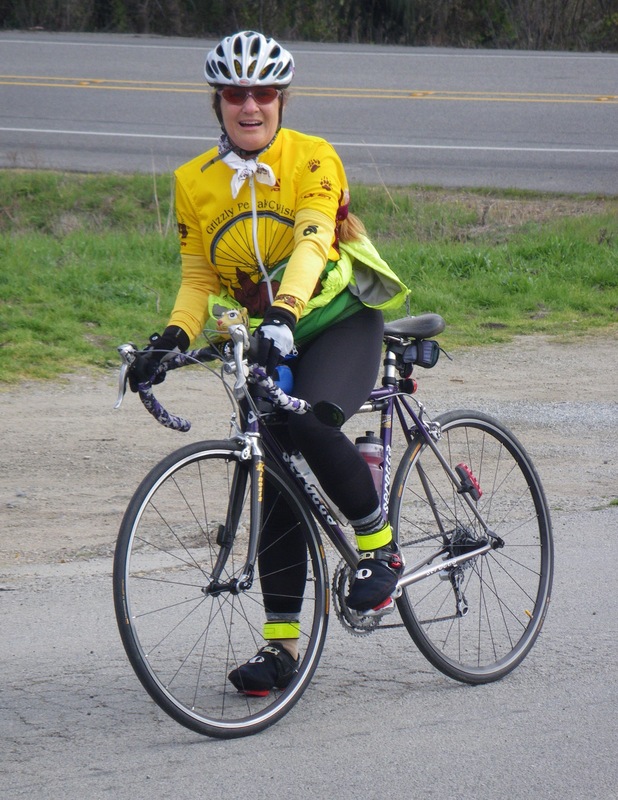 The result, Sherie had a quick workout on Saturday, over fifty miles with 2800 feet of climbing. After a lunch in the sunshine at Pescadero, we turned up Stage Rd northward toward Tunitas Creek road. Sherie was bit hammered, not a lot of leg power to spare, but did hang with the group as her capabilities have increased.On Tunitas Creek Rd, the start is through some ranchettes in a nice little valley. One has a “bike hut” that is honor-system self-serve for folks like us. Snacks and bike parts, with a payment jar, in a little shack in a nice roadside garden. 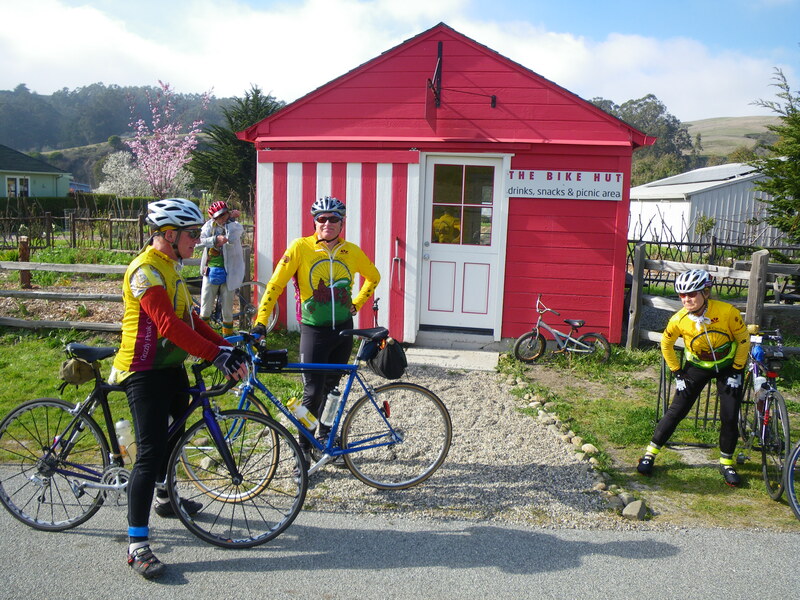 After this quick stop, the group continued to the heart of the ride: the ascent of Tunitas Creek Rd. This road soon rises through a mixed redwood forest over 2000 ver feet in about five miles, with about two miles at a ten percent grade. Needless to say, this climb will test those climbing muscles! Because it is twisty and narrow, there are few cars, although some motorcyclist love to ride it for the same reason that bicylist do: beauty, fun turny road, and quiet seclusion. Ben started near the rear of the pack, and enjoyed digging into his strength to climb past most all the group. One at a time he passed others, until at the end he and Janet rode together and talked. Janet loves to draw Ben out, and he shared hopes and dreams of Italy this summer, and the Maratona. Her enthusiasm is great, and makes Ben feel like his dreams are not aberrant at all, but perfectly reasonable! Meanwhile, Sherie, with he newly-gained climbing strength, was near the middle of the group up the hill! How great she felt to not be near the end of the pack, even though she admitted she was hammered and at the edge of her endurance. When the day had completed, your Maratona Dreamers had done another 51 miles, but this time with 5600 feet of gain. The weekend total was over 100 mile, with lots of hills, and four very tired legs. As the rainy weather returned on Monday, Ben and Sherie gladly took some days off the bikes to rest and recover. Training schedule be damned; our bodies told us to rest up a few days to allow all the work on the weekend make us stronger.